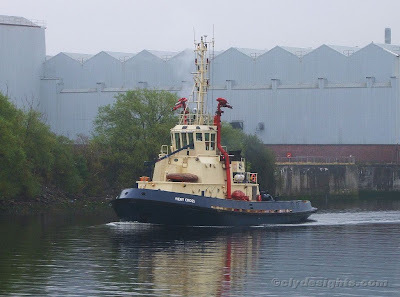 The latest Svitzer tug to put in an appearance on the Clyde is FIERY CROSS, which arrived earlier in the day just in time to assist berthing the three Canadian warships visiting Glasgow. She is seen here heading back downriver after assisting a Canadian destroyer to berth in King George V Dock. FIERY CROSS - normally based on the Tees - was built in 1992 by Richard Dunston at Hessle, and differs from most of the company's other vessels here on the Clyde as she has Voith Schneider propulsion rather than the more common azimuth drive. FIERY CROSS, which has a gross tonnage of 296 tons and an overall length of 30.58 metres, has a bollard pull of 40 tonnes.